The Upbeat Dad! 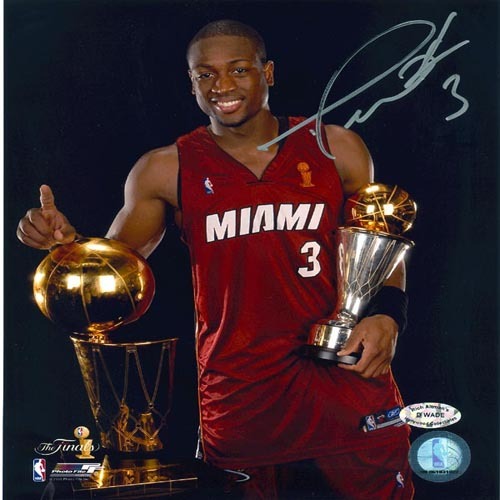 : NBA Star Dwyane Wade: A World Champion Dad! 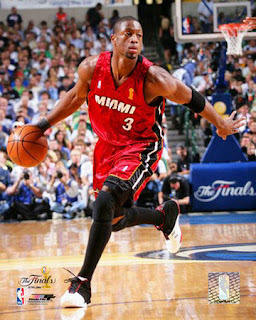 The NBA Finals are heating up as the Miami Heat and Dallas Mavericks square off in a rematch of the 2006 Finals. I’m a Miami resident so I’m kinda biased as to who I’d like to win the series. But as a basketball fan, I just like to see two dynamic teams with talented players display their talents to a worldwide audience. Miami boasts its Big 3 – Dwyane Wade, Lebron James and Chris Bosh, while Dallas boasts Dirk Nowitski, Jason Kidd, Jason Terry and a deep, well-balanced team. Wade, the shooting guard for the Heat, is a perennial all-star. This is his 8th season. He’s performed at a high level since he first entered the league out of Marquette. He led Miami from a 2-0 deficit in the 2006 Finals to win 4 games in a row and win the championship, being named the Most Valuable Player (MVP) in the process. The world got to see what we in Miami have known for quite some time – Dwyane Wade is a superb player. Now here is where you ask the question – what does this have to do with The Upbeat Dad? As Paul Harvey might say, “Here’s the rest of the story.” Wade is undoubtedly one of the top 5 players in the NBA. Yet, if you follow him closely, you’d learn that, more than loving his work as a professional athlete, he loves being a dad. How do I know? Read on. 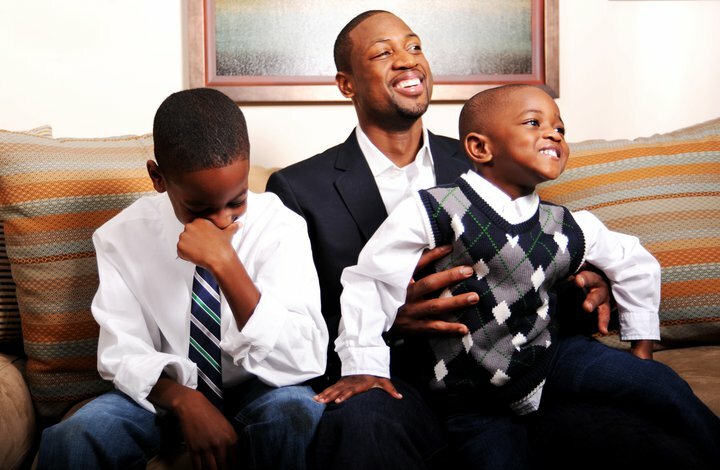 Last November, in the post NBA Star Dwyane Wade’s Got His Priorities Straight , I shared how I admire the fact that, though he’s a superstar athlete, his role as a father seemed to be a greater priority to him. At the time, he was in the midst of a legal battle with his former wife for custody of their two young boys. For a professional athlete who has so much going on, the fact that he’d even consider undertaking such a pursuit is to be admired. 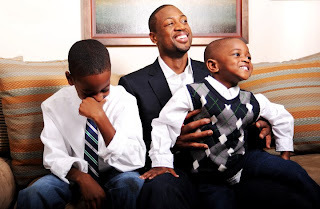 On Wade’s Twitter account, his bio simply states, “I’m a father first and everything else after that.” As you might see as you read this, on our blog, with well over 30,000 hits so far, that post is by far our most read to date. How did that happen? Well, after I wrote it, it seemed to be quite popular among our readers. Then I thought to send it out to Wade himself. He not only read it, but he replied saying thanks and then he retweeted the post. That means he sent it out to all his Twitter followers – currently well over a million people. That was a wonderful and much appreciated gesture on his part. Even more wonderful, is what has occurred since then. 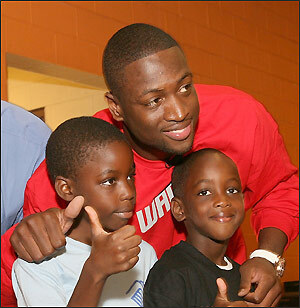 In March 2011, in the heart of the basketball season, Wade was awarded full custody of his sons. And he didn’t miss a beat. They came to live with him from his native Chicago and he put all the pieces in place for them to have a smooth transition to living with him in Florida. Understandably, he travels quite a bit, leading the team into the playoffs and now, to the brink of a championship. But still, he’s not the stereotypical deadbeat absentee dad that athletes are sometimes perceived to be. He’s developed a system whereby his boys are in a loving, stable environment while he continues to pursue his career goals. Now, here’s the highlight of this post. During the Finals, each of the stars of the Heat and Mavericks recorded a brief video with them holding the Larry Obrien championship trophy and saying what winning a championship means to them. In game 3, Wade’s video aired and when I saw it, I quickly grabbed my Blackberry and emailed his quote to myself – it was that special. Here’s what he said, “It's the best feeling besides seeing my sons born.” With all eyes of the basketball world watching, he let everyone know that even greater than being a champion athlete is being a champion dad. And because of his track record, it’s clearly evident that those aren’t simply words to him – it’s a portrayal of his life as a father. So often we read of stories of absentee dads. So often we learn of African American athletes who are sued for not paying child support. Yet, here is one who consistently performs at a high level and is in full demand for interviews, endorsement deals and so many other things. But through it all, his kids are his primary focus. For a celebrity who lives in the limelight to embrace such a philosophy is really something to admire. 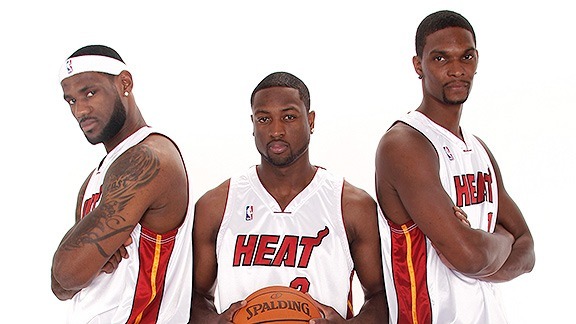 As a Heat fan, of course I’d like to see them win the championship. 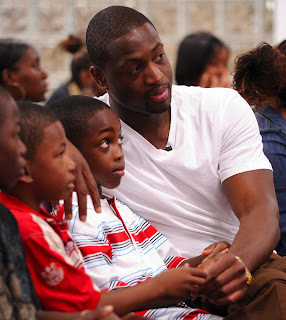 But particularly so because Dwyane Wade has chosen to “be a father first and everything else after that” – even if “everything else” includes multiple NBA championships. Being a dad is that important. I hope that in your own life, you would learn from his example. Whether or not you’re a basketball fan, I trust that you learn the life lesson embedded within this post. In the grand scheme of things, it’s irrelevant if the Heat or the Mavericks win the championship. What matters is that our priorities are straight – our kids come first. We each have our responsibilities – in and out of the home. But as parents, if we place our kids first and “everything else after that” the rewards for them and for us can be greater than we might imagine. We can impact the world for generations to come. So, regardless of who you’d like to see win the series, please join me in celebrating Dwyane Wade’s pursuit to be a champion dad!